My Kid Shape Puzzle HD is loaded with shapes of all kinds. Over 50 topics to choose from. They are easy to assemble and the words are then shown and pronounced. This app is sure to keep your kids coming back as the images are colorful and enticing and there is such a variety of puzzles to choose from. The background music is pleasant and calming as well. Future updates will bring more categories. 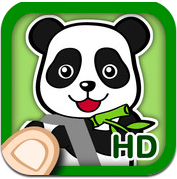 This app is presented to us by Funworks Studio Co. Ltd.
Load of Puzzle Fun to Pick From! Switch from one category to another! My Kid Shape Puzzle HD – Funworks Studio Co. Ltd.
What was the initial inspiration for “My Kid Shape Puzzle”? As a developer, I truly love seeing kids entertained, which is why I want to create an app which both parents and their kids can enjoy. Many educational apps out there have pretty much the same generic designs and ideas, and I want to make something that kids can fully get something out of, yet still containing colourful, entertaining, unique and interactive perspectives which add a new meaning to the word “fun”. My favourite aspects of this app are the beautiful artwork and the animation that I put plenty of effort into in order for kids to interact with the puzzles. It is also affordable, which is one of the most important factors that parents are looking for in an app. “My Kid Shape Puzzle” is only the first out of the many educational apps which I am planning to create. I hope all of my apps will bring great entertainment for kids. Thank you for supporting Funworks Studio Co. Ltd!